This gym is aimed at patrons over 50 years of age. Please contact the gym directly to register for the class (07) 5523 9771. Please note that Wednesday morning classes are currently not running. What is a Tao Yoga Foundation class? The 8 Immortal Tao Yin is a set of 9 ancient Taoist Yoga longevity exercises, with 8 opening forms and 1 closing form. The following video shows Yuko from TaoYoga Kamakura, Japan, performing the first 4 exercises in the 8 Immortal Tao Yin. 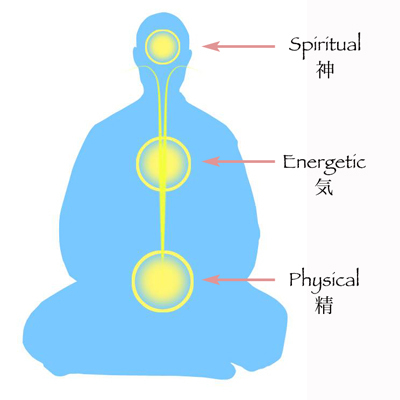 Below is a diagram of the 3 Dantian, the 3 Inner Elixir Cultivation Fields of the body, which we cultivate in our practice, in particular the Tao Longevity Breath Training.